Preheat the oven to 325 F. Oil a 9 x 13-inch ceramic baking dish. Arrange the tomatoes cut-side up so they fit snugly in the dish. Sprinkle the sugar over the tomatoes evenly. 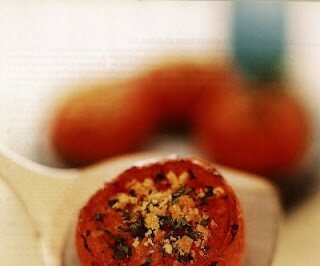 Drizzle the oil over the tomatoes and season with salt and pepper. Roast for 1 1/2-1 3/4 hours or until browned and slightly shriveled. Halfway through, poke the tomatoes with a fork to help release some of the juices. Spoon the juices over the tomatoes a few times as they cook. After the tomatoes have cooked, remove the excess juices with a bulb baster into a small saucepan and reduce on medium heat for about 5 minutes or until slightly thickened. Reserve. Combine the topping ingredients and taste for seasoning. After 1 1/2 hours, sprinkle the topping evenly over the tomatoes. Drizzle the olive oil on top, along with any reduced juices. Roast another 20-30 minutes or until the tomatoes are crusty golden brown. Serve immediately. Remember to store tomatoes at room temperature. If they are not quite ripe, store them in a sunny place to hasten the ripeness. Tomatoes vary widely in the amount of juice they exude, so just add a bit of water if you find the pan is dry during roasting. These can be made up to 8 hours ahead and kept at room temperature. Serve at room temperature or reheat in a 325 F oven for about 15 minutes. Preheat the oven to 425F. In a large shallow roasting pan, combine the vegetables, and garlic cloves and toss to combine. Drizzle with the oil. Add the thyme, salt and pepper, and mix well, being sure to coat all the vegetables evenly. Place the roasting pan in the oven and roast for 40 minutes, turning the vegetables once. Continue roasting for 10 more minutes or until crisp, brown and cooked through. Taste the vegetables for seasoning, spoon them into a serving bowl and garnish with parsley. Serve immediately. May be prepared up to 4 hours ahead, kept at room temperature and reheated in a 350F oven for about 20 minutes. Preheat oven to 350F. Toast hazelnuts in oven for 10 minutes. Remove and rub off skins with a dish towel and coarsely chop. Reserve. In a food processor fitted with a steel blade, process the garlic, shallot, and red pepper until minced. Add the vinegars, lemon juice, mayonnaise, salt, pepper, and basil. Process until combined. With the motor running, slowly add the olive oil. Taste for seasoning. Set aside. Preheat the oven to 350F. Toast the pine nuts until lightly browned, about 5 minutes. Set aside. Increase oven temperature to 450F. Place the asparagus spears on a baking sheet and toss with the oil and salt and pepper so they are evenly coated. Roast for about 12 minutes or until tender, very slightly browned. The time will depend upon how thick the asparagus are. 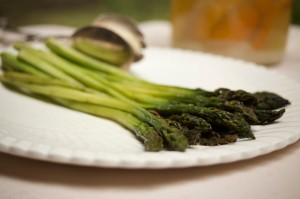 Using tongs, place the asparagus on a platter and spoon vinaigrette over. Sprinkle with toasted hazelnuts; serve warm. When ready to serve, pour the vinaigrette evenly over the asparagus. Sprinkle the diced red pepper and toasted pine nuts on top and serve immediately. 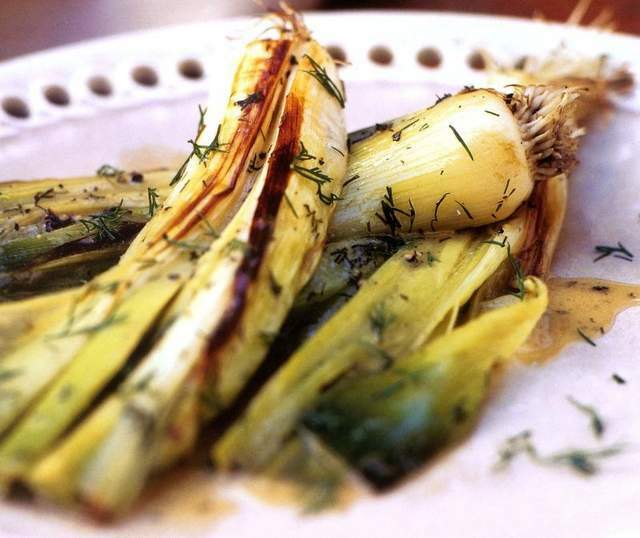 In a skillet large enough to hold the leeks in one layer, heat 2 tablespoons of the olive oil over medium-high heat. Put the leeks in the skillet and cook, using tongs to turn them, for about 5 minutes, or until lightly browned. Add the broth, cover and cook for about 10 minutes, or until the leeks are tender when pierced with a knife. Transfer the leeks to a serving platter with a rim. Off the heat, add the remaining 1 tablespoon oil, lemon juice, mustard, parsley, lemon zest and garlic to the skillet, and whisk to combine. Season with salt and pepper. Spoon the mixture over the leeks and garnish with parsley. Serve immediately, or chill. May be made one day ahead, covered and refrigerated.